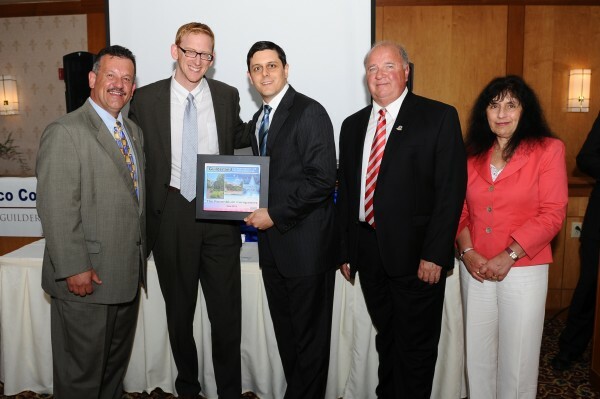 We’re thrilled to announce that The Rosenblum Companies received the 2015 Town of Guilderland “Green” Award, given to a business that has made significant beautification renovations with the environment in mind. The Rosenblum Companies is receiving the Green Award for numerous initiatives we have undertaken to ensure that our Great Oaks Office Park is both aesthetically pleasing and sustainable including new solar-reflective roofs and low profile, energy efficient LED parking lot lights, porous pavement parking lots to mitigate storm water runoff, construction material and carpet tile recycling, and low-impact integrated pest management (IPM). All three buildings at Great Oaks are also ENERGY STAR certified; commercial buildings that earn EPA’s ENERGY STAR use an average of 35 percent less energy than typical buildings and are responsible for 35 percent fewer greenhouse gas emissions. The Green Award is one of eight Town Beautification and Chamber Awards, and the only one that is not necessarily given annually. Each winner was nominated by community and chamber members and then selected by a committee consisting of Town officials, the chamber’s annual dinner committee, and members.